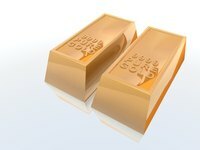 Testing a piece of gold's authenticity is a necessary way to determine whether your gold is synthetic or not. You can test gold leaf in the same way as pieces of gold. Common testing methods include acid and scratch testing and electronic gold testing. Gold leaf is gold that has been pressed into thin sheets, commonly used for gilding in arts and crafts, manufacturing trophies and in decorating. Place a small piece of gold leaf over the test stone. Scratch a line on the gold leaf by rubbing the needle provided across the surface. Pour a drop of the acid from the bottle in the kit that corresponds with the test needle used, over the test stone and the gold leaf. Compare the color change on the gold to that of the legend that came with the kit. Fill the well in the machine with the activator fluid. Attach the gold leaf to the machine and dip one end of it in the liquid, taking care not to allow the leaf to touch the sides of the well. Analyze the results. Compare the lights on the machine with the manual and determine that purity of the gold leaf.